The Pursuers may have been knights who were cursed. Like Paladin Leeroy, they were given a mission to atone for their sins; to hunt down and kill all other bearers of the darksign which indicates they are cursed. They may have been convinced that this would cure them of their own curse and therefore symbolically atone for their sins. What we know for sure is that the Pursuer hunts those who are Undead. It has a large quiver on its back that carries an array of weapons, presumably taken from Undead like us who were defeated. They may have been a part of a kingdom we know about, we can’t be sure. It is possible they were warriors of Alken. The Ring of Blades can only be gained by defeating the Pursuers scattered across Drangleic and its text indicates it was made in Alken. The Pursuers are very susceptible to lightning damage and can be poisoned. These two facts indicate they are both hollow/cursed and human, along with the pronoun “he” associated with them in descriptions. The Pursuers’ associated descriptions indicate they are carrying out a mindless task given to them from long ago, in a similar vein to the soldiers found at the Forest of Fallen Giants. There are a number of interesting facts about the Pursuer that have no definite answer or reason. 1. 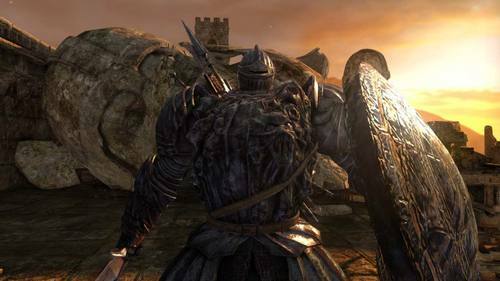 The Pursuer can shroud its sword in a blue color then stab the Player, cursing them instantly. It is strange to think that a being designed to kill bearers of the curse, could curse them further, though perhaps it simply serves to hurry them along the path of hollowing. The Pursuer can also produce dark orbs from its chest that track the player’s movements. When it does this it tilts its head and chest upwards and dark smoke comes off it. These movements seem to indicate it is struggling or conjuring up dark energy housed within it. 2. Its armor is covered in the engravings of screaming faces, seemingly indicating that it contains souls in anguish. This along with the fact that dark orbs come out of it may indicate that it absorbs defeated Undead. 3. The Pursuer can levitate. He is not able to fly, because one of the Pursuer’s uses an eagle to be carried from area to area. 4. The Pursuer’s helmet visor flashes red when first encountering him in the Forest of Fallen Giants, almost implying a similar effect/ability to the Redeye Ring, but perhaps targeted at Undead. 5. The Ultra Greatsword of the Pursuer is renowned. It was known as the mightiest of the straight swords, demanding great strength and dexterity of its wielder. This may mean the Pursuer(s) were warriors of great strength and importance in the Kingdom they came from. Whatever the true story is about this character(s), it remains shrouded in mystery. Soul of A/The Cursed One who wanders the land of Drangleic. The Cursed One, who was ordered to hunt those who bear the mark, even now carries out his mission. known as the Mad Warrior of Arken. Increases the equipper’s physical attack power. Two countries, Arken and Vane, once existed on these lands. Though they shared similar origins they despised each other greatly.